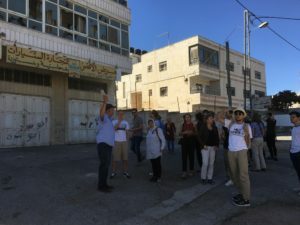 Between local and general elections: Where is the political map in Israel heading to? 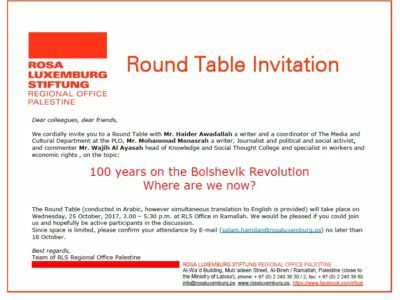 Round table on :100 years on the Bolshevik Revolution, Where are we from it now? 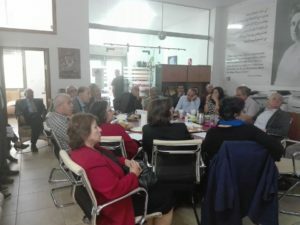 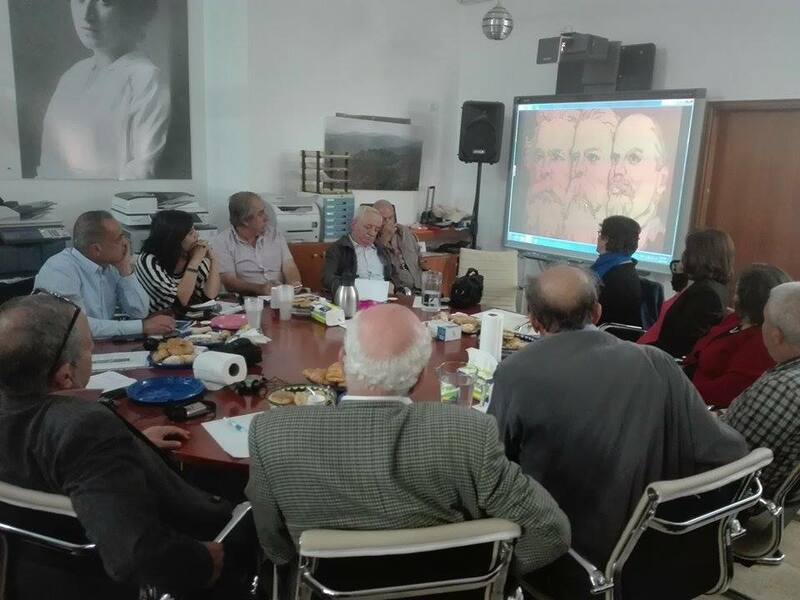 The round table has taken place on 25 October 2017, at the RLS office in Ramallah. Two speakers; Haider AwadAllah and Mohammad Manasra, and a commentator Wajih Alayas, have presented short interventions on the historical context and perspective of the Bolshevik revolution; the debates between Lenin, Rosa Luxemburg, Trotsky, Plekhanov, and others, The controversial positions towards the Mensheviks, the impact of the revolution on the national movements worldwide and in Palestine specifically…etc. 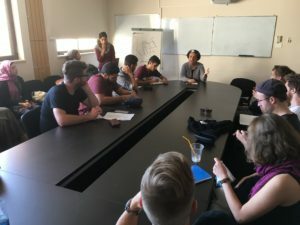 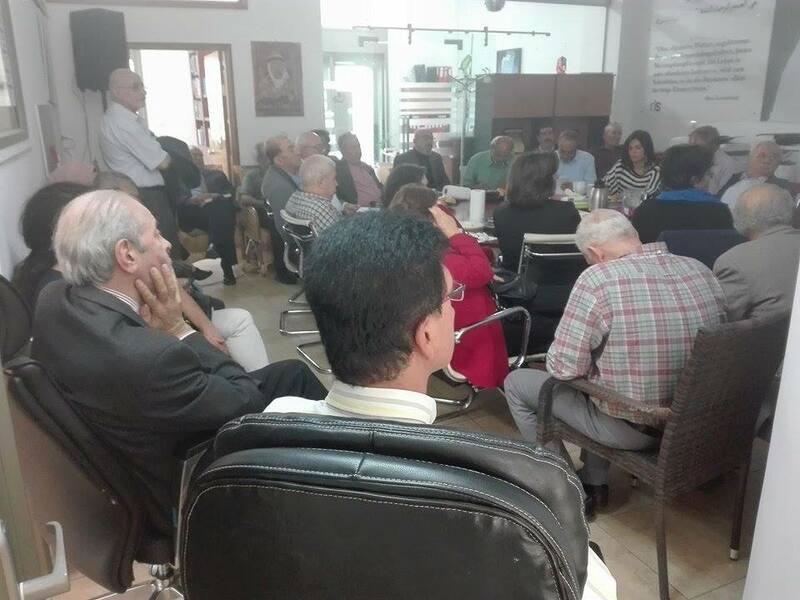 Approximately 35 people, from the RLS network and from the Palestinian civil society and political parties, have attended and have enthusiastically engaged in the discussion. What are the highlights and the downfall of the revolution? 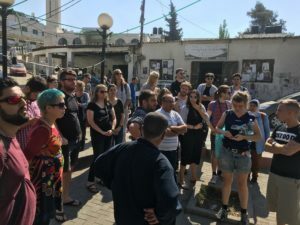 What lessons have we learned? 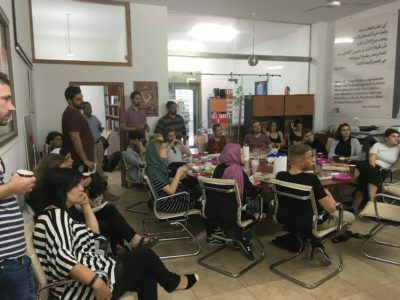 And how can we invest in it today? 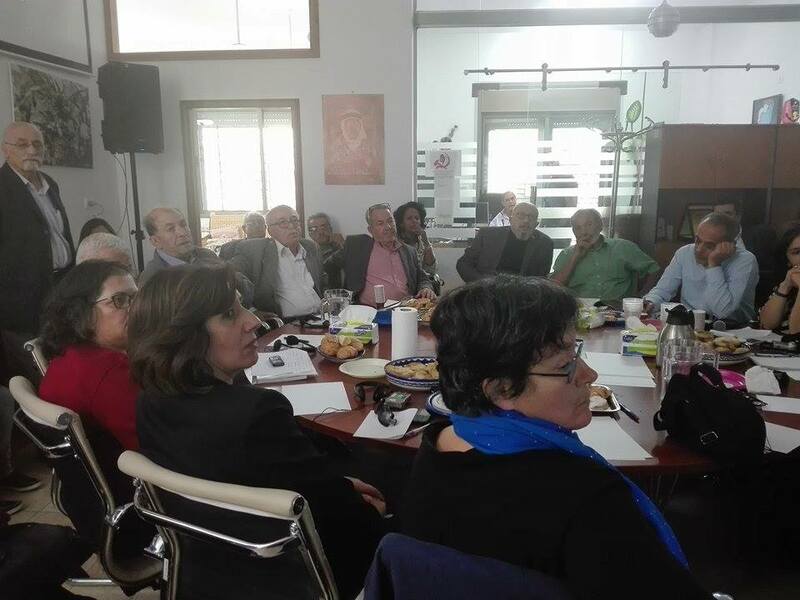 Were the major questions of the round table, that we have discussed and we still carry it with us along the way. 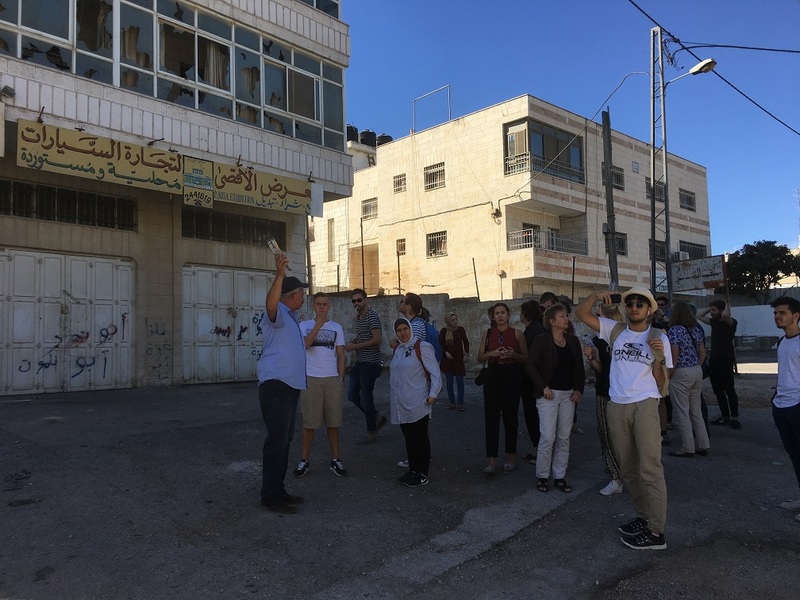 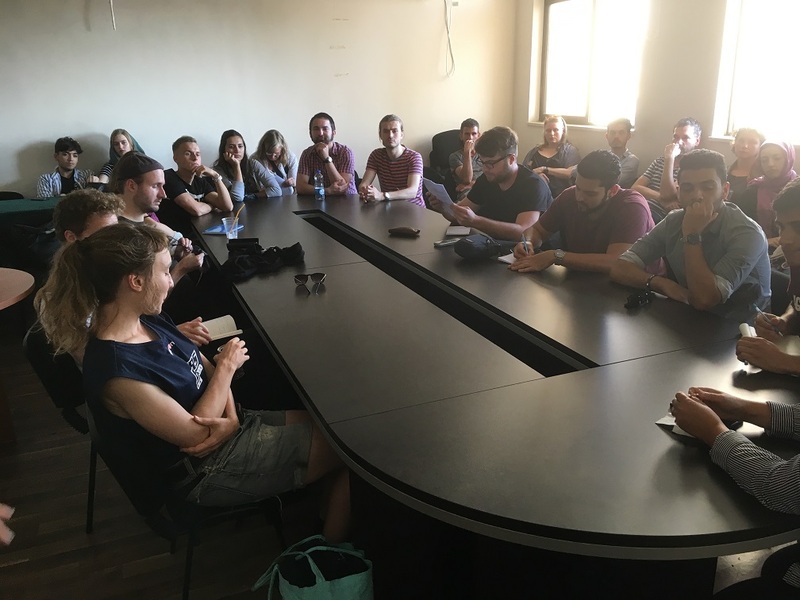 RLS Regional Office Palestine hosted 22 MA & PhD students from Germany, to introduce them to the socio-economic situation of the OPT. 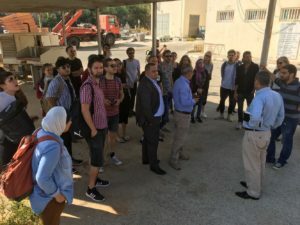 The visit that was coordinated with the scholarship department at the HQ of RLS Berlin, lasted for two days and included visits to different Palestinian communities including Jalazoon refugee camp, Jiffna village and Ramallah & Al Bireh cities, where they met officials from Al Bireh municipality, representatives of civil society organizations and professionals . 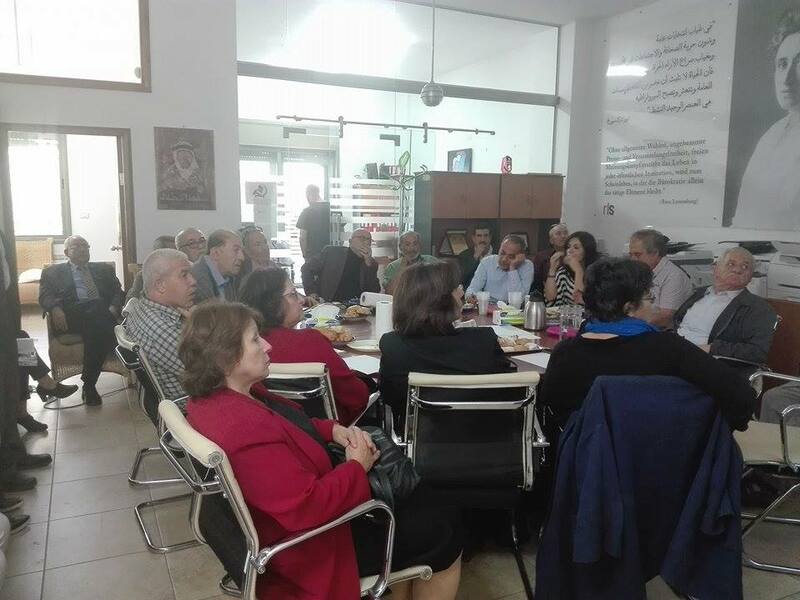 The deligation also visited Birzeit University and met professor of economics and representatives of the students at the university to better know the academic challenges and potentials. 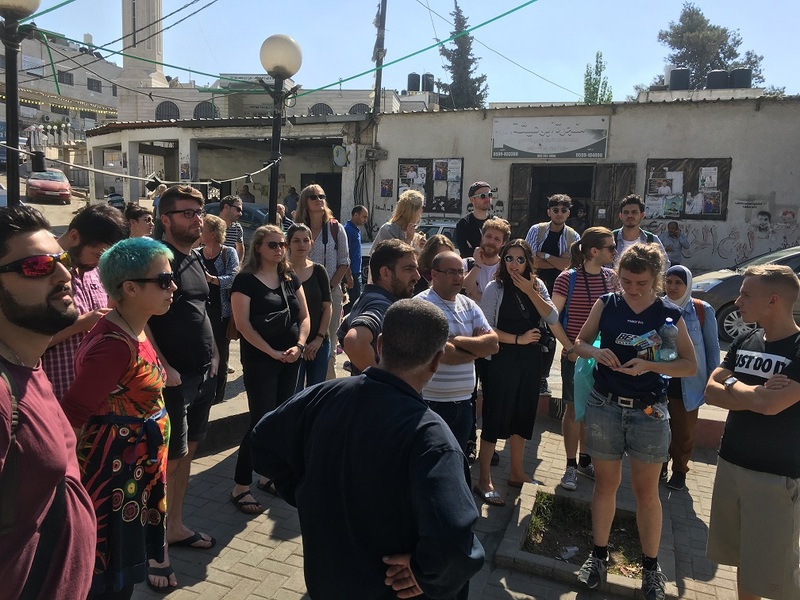 The second day of the visit was dedicated to visit Jerusalem and the surrounding areas. 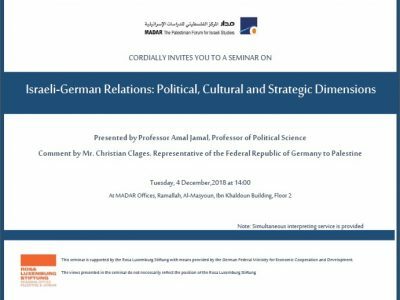 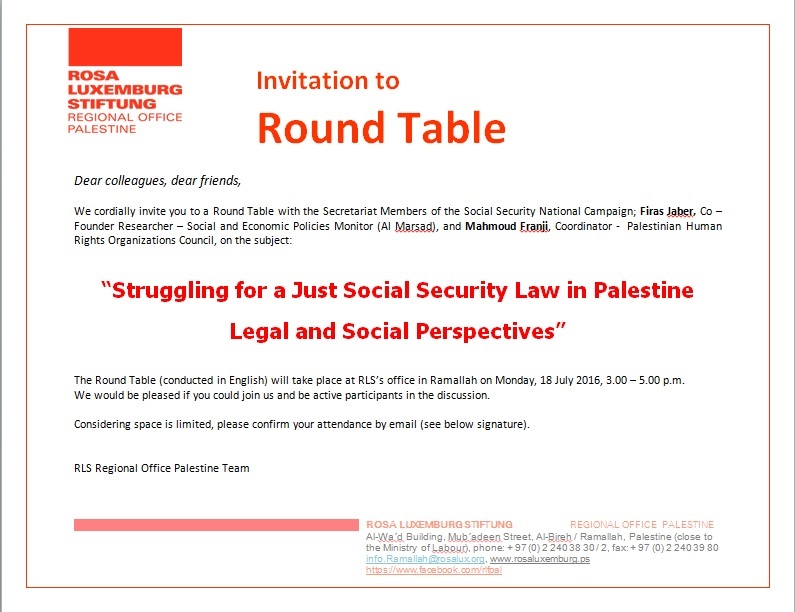 The Round Table (conducted in Arabic, however simultaneous translation to English is provided) will take place on Wednesday, 25 October, 2017, 3.00 – 5.30 p.m. at RLS Office in Ramallah. 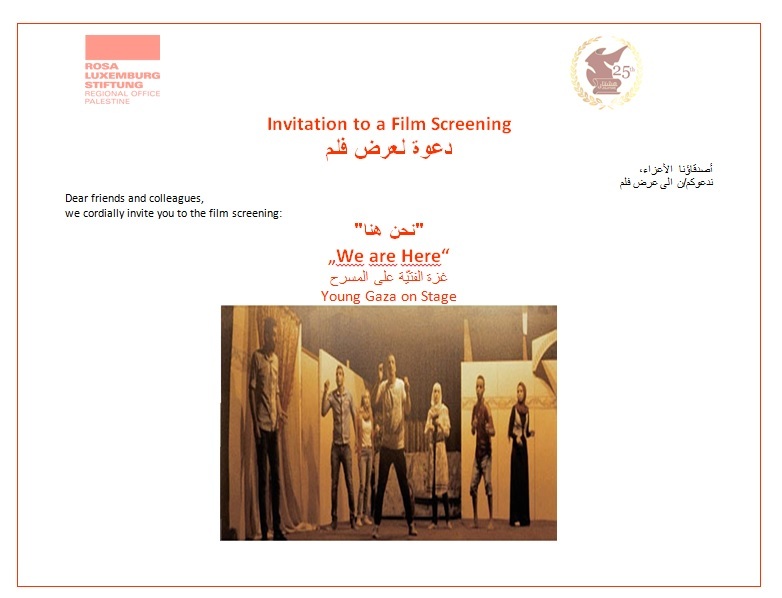 We would be pleased if you could join us and hopefully be active participants in the discussion. Since space is limited, please confirm your attendance by E-mail (salam.hamdan@rosaluxemburg.ps) no later than 18 October. 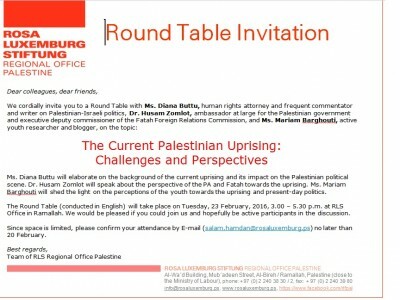 Ms. Diana Buttu will elaborate on the background of the current uprising and its impact on the Palestinian political scene. Dr. Husam Zomlot will speak about the perspective of the PA and Fatah towards the uprising. 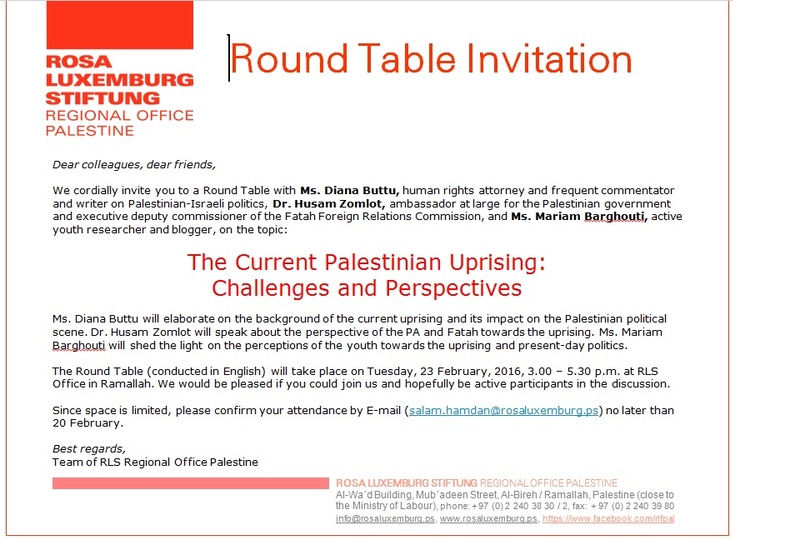 Ms. Mariam Barghouti will shed the light on the perceptions of the youth towards the uprising and present-day politics. 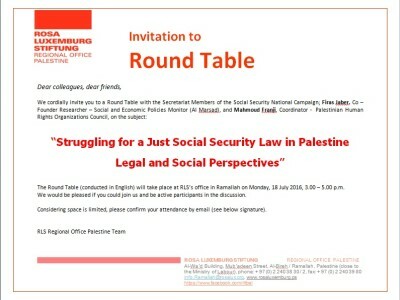 The Round Table (conducted in English) will take place on Tuesday, 23 February, 2016, 3.00 – 5.30 p.m. at RLS Office in Ramallah. 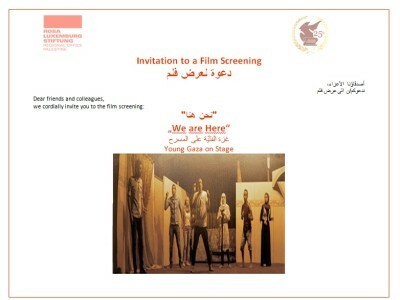 We would be pleased if you could join us and hopefully be active participants in the discussion. 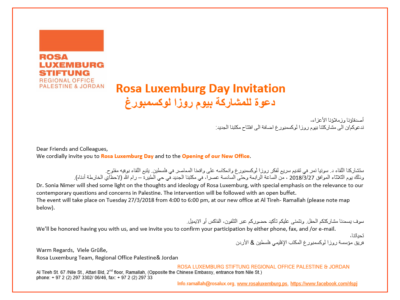 Since space is limited, please confirm your attendance by E-mail (salam.hamdan@rosaluxemburg.ps) no later than 20 February. 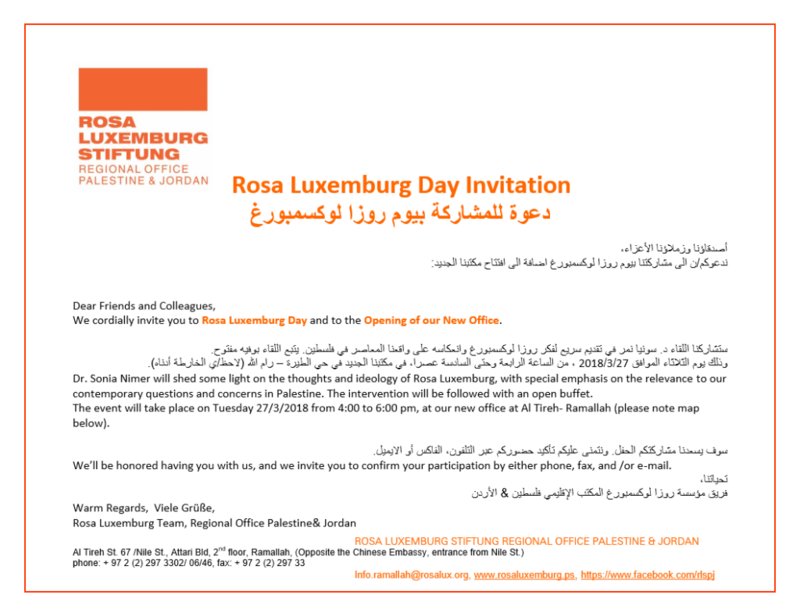 Katja Hermann, director of the Rosa Luxemburg Stiftung Regional Office Palestine, on the recent Gaza events – book reading and exhibition opening – at RLS headquarters in Berlin and RLS Mecklenburg-Vorpommern e.V. The documentations in English and German include an Arabic text on the events by Bessan Shehada, RLS project coordinator in the Gaza Strip.